It is time to build our clergy directory for 2012 and the cornerstone of a photo directory is, of course, the photos. 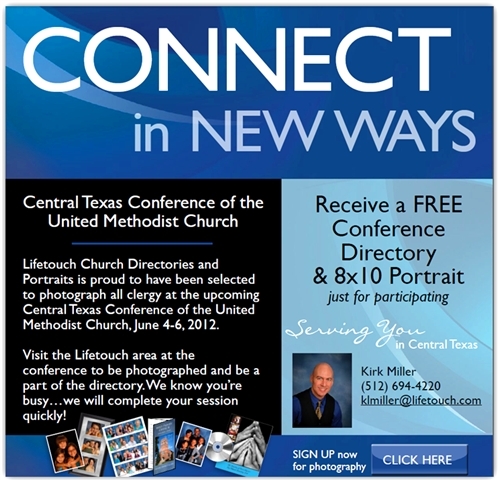 Photos for the directory will be taken during the three days of Annual Conference. To make the best effort to have things run smoothly and take as little of your time as possible, an online scheduling tool has been created so that you can sign up for photo appointment time that works best for you. Just click here or the image to the right and then follow the instructions found on the right side of the webpage. Dress in something you like and that you are comfortable in. If you’ve ever worn something and been told you look good (by someone other than your mother or your best friend) you might want to wear that or that color as it probably is a good look on you. It is best to avoid white or other really light colors (tan, peach, pink, white or yellow) as your primary color; avoid anything that is really close to your skin tone. Generally medium to darker colors are more flattering – medium to dark shades of green, rust, wine or blue; earth tones also generally look good against standard photo backdrops.